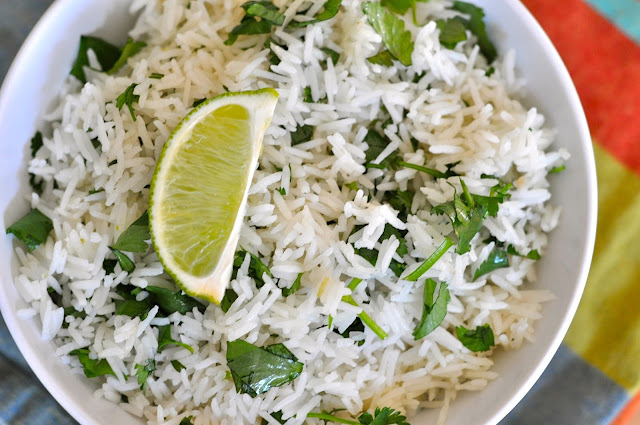 Basmati is a long-grain, non-glutinous rice which has a gorgeous perfume to it that makes a lovely side to any meal. It is possibly the world's most sought-after rice because of its alluring smell and can fetch 10 times the price of other rice grains. If you're intrigued by rice in general, consider starting your education with my earlier articles: Rice Rules, Comforting Congee and The Rituals of Rice. What makes basmati so fragrant? A laboratory examination of the grain indicates it contains 0.09 parts per million of the compound 2-acetyl-1-pyrroline, which is 12 times more than concentrations found in unscented rice. Basmati rice also cooks up nicely, puffing up length-wise and becoming very fluffy, fantastic for mingling with spicy foods and sauces. 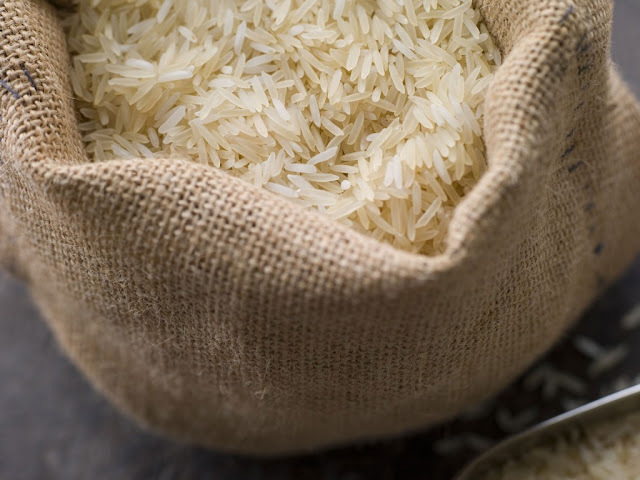 In the Hindi language, basmati means "Queen of Fragrance." The grain has been cultivated at the base of India's Himalayan range in India for thousands of years, in the areas where the Yamuna and Sutluj rivers flow. Apparently, top quality basmati is primarily grown in the Karnal (known as the "rice bowl of India"), Kaithal, Kurukshetra, Panipat and Ambala regions of Haryana. Punjab and Jammu are also major producers. Indian rice cultivation is found in all states including West Bengal, Uttar Pradesh, Orissa and Bihar, which are all top producers. Rice is considered the most important food crop in India, taking up 44 million hectares -- regarded as the largest rice-growing area in the world. While basmati is the most prominent grain planted, hundreds of varieties of indica rice are also being tilled. Rice provides the main income for more than 50 million households in the country and is a staple for 65% of India's one billion population. (Source: UN Food and Agriculture Organization). Basmati also has some spiritual or physical aspects, according to the ancient practice of "Ayurveda." If you haven't heard, ayurveda is a method of healthy living which includes concepts of mental, physical, social and spiritual harmony. There's much more to ayurveda than what I can tell you in a simple column but think of mixing Chinese medicine with the philosophies of yoga. According to ayurveda, basmati is saatvic or pure and therefore, beneficial for the body and easy to digest. It is considered an excellent remedy for balancing your vata (metabolism) and pitta (energy production). By the way, ayurveda practice means avoiding instant or pre-cooked rice because it has less prana (life force) in it. 1. You are supposed to wash basmati thoroughly before cooking it because there is so much starch clinging to its grains. Wash two to three times with your hands. 2. I once watched British Indian cooking doyenne Madhur Jaffrey on television and she recommended that you soak basmati for at least ½ an hour to an hour in cold water prior to cooking. Remember to drain the water again and then fill. 3. Next, the quantity of water should be either be 1 to 1.5 rice to water ratio if you want firm rice, or 1 to 1.75 rice to water ratio if you like your grains more tender. 4. A tiny bit of oil, butter or ghee (clarified, unsalted butter) and a teaspoon of fresh lime juice added while cooking can keep the grains separate. 5. Make sure you cook it in a heavy pot and do not disturb the rice or take a peek while its in the middle of cooking. Let it sit for awhile after cooking before going in there with a spoon.